Back in August, when this column kicked off, it started with: New Season, New Shirt. That made sense. But I know some of you diehard fans are shaking your heads at the idea of buying something new for the playoffs. Can’t mess with the mojo, Dom. I haven’t washed my Rodgers jersey since Thanksgiving! That’s fine for some, and I’m not here to tell you to stop being ridiculous and launder your lucky shirt—that’s your significant other’s job. But for those who celebrate every team achievement by buying some fresh duds, this column is for you. 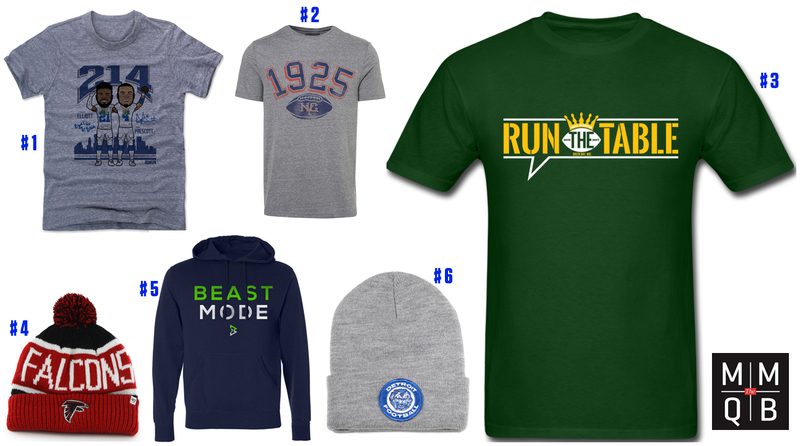 Below is a brief look at all 12 playoff teams and a few apparel recommendations for you to wear while cheering your team to Houston in February. As usual, I tried to incorporate smaller, local brands along with the Nikes of the world, and I also included items for female fans too. Let me know what I missed and enjoy the games. Go Team! Click the bold red links for purchasing information. Bill Belichick loves his three-word phrases—Do Your Job. On To Cincinnati. And now, Ignore The Noise. Good gear from the guys at Pats Propaganda, who will be sure to keep you posted on The Hoodie’s sartorial selection for the posteason too. Hard to go wrong with a knit beanie in the Midwest in the middle of January, especially one made by a local brand. Love the old-school pom on top. This T-shirt is simple, declarative and has just the right amount of snark. The folks at Steel City do good T-shirt work and you’d see plenty of it Sunday at Heinz Field ... if the high wasn’t forecasted to be 19°. Let’s be real, Texans fans. It’s not going to get much better than an AFC South championship this season, so flaunt the achievement with pride. Pro tip for the coupon cutters: this product will be $2.99 by the end of the month. The MMQB’s own Bobby Klemmer said it best the other day, so I’ll just piggyback on his hot take. I have to imagine the 500 Level is not ready for the influx of Connor Cook T-Shirt orders coming their way. I’m firmly in the Never Support The New Logo camp when it comes to the Dolphins, as you’ll find with all four of my recommendations. This hat also was designed by Kenny Stills, so hard to go wrong here. I like the Ezekiel Elliott-Dak Prescott shirt just fine, but to be honest, the entire 500 Level section on Dallas is a treasure trove. Took real internal fortitude not to follow through on this threat. I’m not going to sugarcoat: this beanie was my least inspired choice. Not a lot of fun independent brands touting Falcons apparel. (Know some? Let me know.) I imagine that’ll change if they’re Houston-bound in a few weeks. Rather than forget the past, Seahawks fans should honor it with this hoodie—especially since the run game continues to struggle without action boss Marshawn Lynch. This goes one of two ways: 1) You buy this shirt now, and you’re in on the relative ground floor of an amazing five-week run to another Lombardi; or 2) Everything comes crashing down Sunday and you’re stuck with a relic of something you’d rather forget. 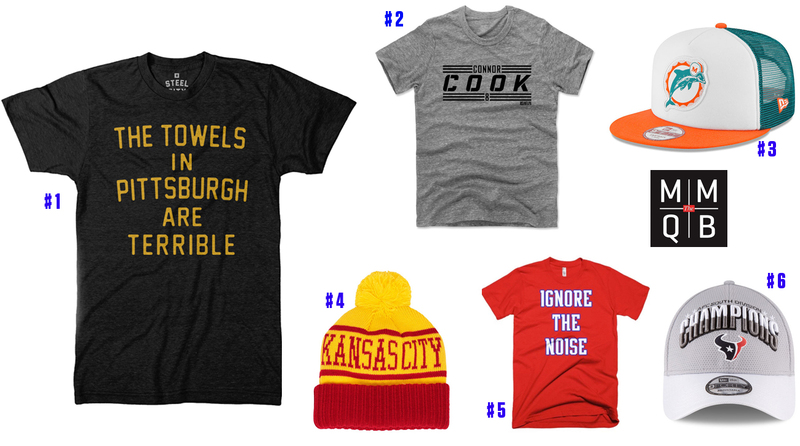 I own items from Streaker Sports, so can personally vouch for the comfort of these vintage-inspired shirts. And if people ask you what 1925 means, just tell them it’s the flight number for Newark to Miami, a.k.a. the OBJet. Good news for Lions fans: Should the Leos fall short Saturday—and let’s face it, they might—this beanie will still keep your ears warm all winter and be all ready to go for the 2017 season next fall.